Here are the links to the Scratch website where you can create your own Scratch programs following the instructions in Coding for Beginners using Scratch. Please note, Scratch 3 was released in January 2019 and is now the latest version. Scratch 3 is very similar to Scratch 2. To find a list of the changes, click on the link below "Using Scratch 3". This book was written for Scratch 2. If you use Scratch 3, the programs in the book will still work, but some of the step-by-step instructions will be slightly different. Alternatively you could download Scratch 2, rather than the new version. You can also visit the Usborne Scratch account to see working versions of all the projects in the book, along with their code, and starter packs with sprites and backdrops. Click on "Create" for a step-by-step guide to getting started. For Scratch 3, click on the download button for Scratch Desktop. For Scratch 2, scroll down to the bottom of the page. See a list of changes for Scratch 3. What do young people learn by using Scratch? At the Usborne Scratch account you’ll find working versions of all the projects in this book, the code for each project, and starter packs with the sprites and backdrops for projects such as the racing car game and virtual pet. Step-by-step instructions on how to use the Usborne Scratch account, and remix and save projects. Instructions for how to use the sprites and backdrops in the Usborne starter packs. Find out how to use your own image as a backdrop in Scratch. Scroll down to find links to the resources. Watch introductory tutorials on how to code simple movements and actions such as changing colour, and tips for using the paint editor. "Remixing" means editing a project, then saving and sharing your new version (see page 81 of your book). Explore the Scratch Wiki for ideas and advice from other "Scratchers" on how to code many different moves, as well as drawing and animation. Scroll down to "Find a Code Club near you" and enter your postcode. An accessible introduction, walking children through the basics before getting them started on some fun projects to stretch their skills. 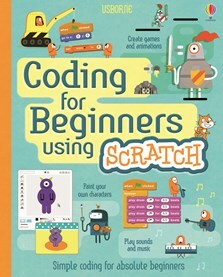 An excellently written and presented book that is crammed with fun and useful material to teach your child all they need to know to become a Scratch (and all-round programming) fan! Coding is made easy with this step-by-step book... just as helpful for parents! This detailed but accessible guide covers all the basics and will have your child writing simple scripts and games in a matter of minutes. for the kids of today. The clear explanations make every project easily achievable and will really give children confidence to tackle coding for themselves; the end results are great fun and very satisfying, giving children a strong sense of achievement. Start from Scratch, literally, and build up your coding skills with the help of this step-by-step guide to one of the most popular coding languages for children. An introduction to the computer language especially suited to beginners. An introduction to coding for complete beginners, this friendly and accessible book will teach children the basics of Scratch. Helps demystify this aspect of computing for practitioners who would like to know more about what lies ahead for their children. A super guide to coding for beginners... Written so clearly and simply that even a non-coding adult could understand it. Does an excellent job of making it a fun and accessible journey for even the youngest readers ... It is both a great starter lesson for moving on to more advanced software and a book to give you a new hobby with which to impress friends.